Half a Cod a Day! 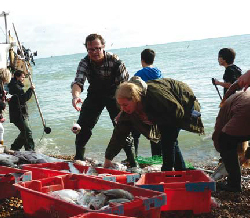 In January 2011, Hugh Fearnley-Whittingstall left the comfort of River Cottage behind, and went on a journey to find out what was really going on at the industrial end of our fisheries. What he found was that things are not just bad ... They’re mad. Hugh learnt that half the fish caught in the North Sea are being thrown back into the sea, dead, because of crazy EU laws. His journey was shown in the first series of Hugh’s Fish Fight. So, Hugh launched a campaign to try to change those laws and was supported by a wide coalition of environmental Non-Governmental Organisations (NGOs), fishermen, companies and policy makers. The response from the UK public was incredible. Over 850,000 people have now signed the Fish Fight petition, and so many people emailed their MPs to protest about discards that they forced a debate in the Houses of Parliament. Even Prince Charles lent his support.